It’s been 29 years since President Reagan signed the law to create a national holiday in honor of Martin Luther King, Jr.
To mark Martin Luther King, Jr. Day, the White House Historical Association has searched their archives and created a slideshow of historic images that show the impact the civil rights leader has had on several administrations. Dr King’s interactions with Presidents Kennedy and Johnson leading up to the Civil Rights Act in 1964, the Voting Rights Act in 1965 and the 1968 Civil Rights Act are well documented, but his first visit to the White House was actually in 1958, when he and other prominent civil rights leaders met with President Dwight Eisenhower. Celebrating Martin Luther King, Jr’s Life and Legacy features images of Dr. King himself at the White House and also includes photos of President Reagan signing the King Holiday Bill in 1983 with Coretta Scott King at his side, and President Obama and his family at the national memorial that was dedicated just last year. Only three people have a national holiday observed in their honor: Christopher Columbus, George Washington, and Dr. Martin Luther King, Jr.
Martin Luther King, Jr. Day, celebrated on the third Monday of January each year, marks the birthday of the civil rights leader and nonviolent activist. The call for a national holiday to honor Dr. King’s legacy began soon after his assassination in 1968—U.S. Rep. John Conyers (D-MI) introduced legislation to establish the holiday just four days after Dr. King was killed, but Congress took no action on the bill. In the years that followed, millions of people signed petitions in support of the holiday. Coretta Scott King testified before Congress multiple times, calling for a federally recognized day to honor the life and work of her late husband. In 1980, Stevie Wonder released a song, “Happy Birthday,” which became both a hit and a rallying cry for supporters of the holiday, and civil rights marches in Washington in 1982 and 1983 only served to amplify their mission. A bill to establish the holiday successfully passed through both houses of Congress in 1983, and President Reagan signed it into law on November 20 of that year. The first Martin Luther King, Jr. Day was celebrated in 1986. Many Americans now honor Dr. King’s legacy by participating in a community service event in their own neighborhood andhis vision of service and volunteering is more critical than ever during this economic recovery. President Obama has called on the nation to participate in a service event in their own community this Monday, January 16, 2012. The First and Second Families, numerous members of the President’s cabinet, and thousands of other Americans across the country have committed to serve, and you can, too. Visit MLKDay.gov to find a service opportunity in your neighborhood and learn more about the Martin Luther King Day of Service. This week, the President traveled to Detroit with the President of South Korea, dedicated the Martin Luther King, Jr. National Memorial, embarked on a three day American Jobs Act bus tour, bestowed the Presidential Citizens Medal. Road Trip President Obama embarked on a three day bus tour to spread the word about the American Jobs Act. Starting the journey in Asheville, NC and ending in North Chesterfield, VA, he also made stops in Millers Creek, NC, Jamestown, NC, Emporia, VA and Hampton, VA.The President visited schools, an airport, a military base, and a fire station along the way all of which will benefit from the American Jobs Act. On the last day of the tour, the First Lady joined the President at Joint Base Langley-Eustis announcing a commitment from the private sector to hire 25,000 veterans and military spouses. The jobs bill would put Americans back to work, upgrade our country’s infrastructure, and keep teachers and emergency responders on the job. Citizens Award Tuesday in the East Room, the President honored 13 Americans with the Citizens Medal, one of the highest honors a civilian can receive. The award is given to Americans who have “performed exemplary deeds of service for their country or their fellow citizens.” The recipients chosen to receive this year’s medal were nominated by the public, and then carefully selected by the White House. Click here to learn more about the recipients and to watch a video showing their reactions to the news that they’d been chosen. MLB support U.S. Veterans As a part of their Joining Forces Initiative, the First Lady and Dr. Jill Biden traveled to St. Louis, Missouri, for Game One of the World Series to meet with military families and to recognize Major League Baseball’s support of those who serve and their families. Earlier that day, the First Lady announced at Joint Base Langley-Eustis in Virginia a commitment from the private sector to hire 25,000 veterans and military spouses. Cutting Waste As a part of the Campaign to Cut Waste, the White House recently updated the Excess Property map that uses new data to pinpoint the location and status of federal properties that agencies have targeted for closure and consolidation. Ending this waste and improving the management of the government’s real estate will save hundreds of millions of taxpayer dollars. President Obama joined the First Lady, Vice President Biden, Dr. Jill Biden and Secretary Salazar of the Interior to honor Martin Luther King Jr. during the dedication ceremony for the Martin Luther King Jr. National Memorial. And so, as we think about all the work that we must do –- rebuilding an economy that can compete on a global stage, and fixing our schools so that every child — not just some, but every child — gets a world-class education, and making sure that our health care system is affordable and accessible to all, and that our economic system is one in which everybody gets a fair shake and everybody does their fair share, let us not be trapped by what is. We can’t be discouraged by what is. We’ve got to keep pushing for what ought to be, the America we ought to leave to our children, mindful that the hardships we face are nothing compared to those Dr. King and his fellow marchers faced 50 years ago, and that if we maintain our faith, in ourselves and in the possibilities of this nation, there is no challenge we cannot surmount. If he were alive today, I believe he would remind us that the unemployed worker can rightly challenge the excesses of Wall Street without demonizing all who work there; that the businessman can enter tough negotiations with his company’s union without vilifying the right to collectively bargain. He would want us to know we can argue fiercely about the proper size and role of government without questioning each other’s love for this country — with the knowledge that in this democracy, government is no distant object but is rather an expression of our common commitments to one another. He would call on us to assume the best in each other rather than the worst, and challenge one another in ways that ultimately heal rather than wound. That is the conviction we must carry now in our hearts. As tough as times may be, I know we will overcome. I know there are better days ahead. I know this because of the man towering over us. I know this because all he and his generation endured — we are here today in a country that dedicated a monument to that legacy. On August 28, 1963, the day of the March on Washington, all of the platform speakers were invited to the White House to meet with President John F. Kennedy. A few months earlier I had made my very first trip to the White House. I was only 23-years-old and also the brand-new chairman of the Student Non-Violent Coordinating Committee. It was amazing. A week into my new job I was headed to the White House to meet President Kennedy. I was with five other great men, including Martin Luther King Jr., Roy Wilkins, James Farmer, and Whitney Young, known as the Big Six leaders of the movement. There were many women who were instrumental to our plans to march and many heroines of the movement, including Coretta Scott King, Fannie Lou Hamer, Dorothy Height, Ella Baker and Diane Nash. However, as was customary in those times, none of them were in the room that day. We told President Kennedy the people could not wait any longer. We were planning to call on thousands to march on Washington. 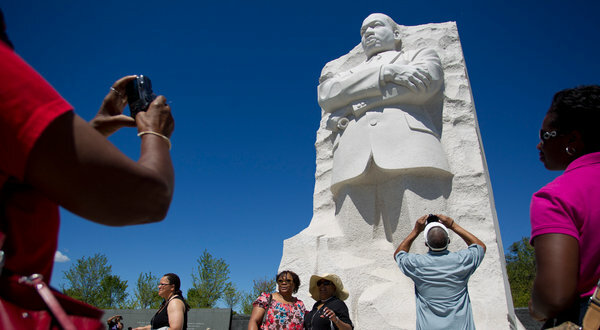 King’s aspirations for this nation were “deeply rooted in the American dream.” And it is because of his unwavering commitment to the cause of justice, the principles of peace and non-violent activism, because of his insistence on the equal dignity of all humanity that he has found his place on the National Mall. Martin Luther King Jr. represents the very best in America. It was his moral voice that helped this nation turn the corner and lay down the burden of a grave injustice. Thus it is fitting and so appropriate that we honor Martin Luther King Jr. in what I like to call “the frontyard of America”. He must be looked upon as one of the founders of the New America. He must be looked upon as one of the founders of a nation more prepared to meet its highest destiny. And that is why the image of this humble Baptist minister from Atlanta, Georgia, a man who was never elected to any public office, can be seen today standing on the National Mall between the monuments to two great presidents—Abraham Lincoln and Thomas Jefferson. We have come a great distance as a nation and as a people, but we still have a great distance to go before we create what Dr. King called the Beloved Community. I define it as a society based on simple justice that values the dignity and the worth of every human being. The struggle to build this kind of community does not last for one day, one week, or one year, it is the struggle of a lifetime. Each of us must continue to do our part to help make this vision a reality. President Obama is doing all he can to help build this sense of community. In the bluster of media hype and political rhetoric, the substantive work President Obama has done to turn our economy around, to assist everyday Americans during this time of financial crisis, and to put people back to work has not gotten enough attention. In his humility this President has not trumpeted his success. He has kept his eyes focused on the challenges at hand, trying to use his power to do what he believes is in the best interest of the American people. Perhaps you remember his demand that we expand and extend unemployment insurance to people who had been laid off. Maybe you heard about his loan modification programs which have offered relief to more than $2 million Americans who would have lost their homes. He added $7.6 billion to the Hardest Hit Fund to help homeowners in the most dire straits, and $7 billion for a program to stabilize neighborhoods blighted by the foreclosure crisis. These resources have been invaluable to my district in Atlanta, one of the hardest hit in the country. Recently, the White House released a report, called Creating Pathways to Opportunity, that highlights the many initiatives this president has fought hard to execute which strengthen the economy while protecting the most vulnerable Americans. With the help of a Democratic Congress, college students now have access to affordable healthcare until they are 26. The President doubled their Pell Grant funding and has enacted 17 tax cuts to free small businesses to be the engine of growth they had always been. President Obama is trying to do his part to help build a Beloved Community. We have a great President in our midst who is trying to do the kind of good that will last. And if each of us will do our part to respect human dignity, to speak up and speak out non-violently for the cause of justice then we can all help build the Beloved Community, a nation and a world society at peace with itself. Congressman John Lewis is the U.S. Representative for Georgia’s 5th congressional district and recipient of the 2010 Presidential Medal of Freedom. King memorial dedication postponed: The 30-foot granite statue has been cleaned. Dignitaries from around the world are in town. And the stage and 30,000 folding chairs are in place. Dedication of King Memorial postponed by Hurricane Irene: The Martin Luther King, Jr. Memorial dedication has been postponed due to Hurricane Irene’s impending assault on the East Coast, NBC News has learned. The dedication ceremony’s organizers — the Martin Luther King, Jr. National Memorial Project Foundation — announced its decision on Thursday night, citing the interest of public safety. If weather permits, the memorial will be open on Friday and Saturday, though the official dedication will be moved to September or October. Irene scuttles Martin Luther King Jr. Memorial dedication: The head of the foundation that organized Sunday’s planned dedication ceremony on Washington’s National Mall for a memorial to the late Martin Luther King Jr. announced Thursday night that the official dedication has been postponed. MLK memorial postponement costs D.C. tourist dollars: Sunday’s star-studded dedication of the new Martin Luther King Jr. memorial in Washington, D.C. was canceled late Thursday due to the anticipated presence of rain and winds from Hurricane Irene. The event, due to be attended by President Obama, Jesse Jackson and hundreds of other dignitaries, has been postponed till fall. “Why you don’t see a lot of race … is because we hope that in the next 100 years, we hope that in the next 50 or 20 years, that won’t be important. It’s important that you have food in your belly, that you have clothes on your back, that you have education.” — Harry Johnson, CEO of the Martin Luther King Jr. National Memorial Foundation. A USA TODAY/Gallup Poll finds that seven in 10 Americans are very or somewhat interested in visiting the memorial. Yet there’s a gap between races: 68% of black Americans are very interested, compared with 22% of whites. Poll: MLK’s dream realized, but a gulf between races remains: Just over half of Americans polled say Martin Luther King Jr.’s dream of racial equality has been fulfilled, and another one in four of those surveyed say major progress has been made toward it. MLK Jr. Memorial Dedication Events: Monday’s debut kicks off a week of black-tie, white-tie and informal events all geared toward raising money for and drawing attention to the memorial and Sunday’s dedication. During that event, President Obama will bury a time capsule that will include items from him, the memorial foundation and the King family, said Harry Johnson, CEO of the Martin Luther King Jr. National Memorial Foundation. National Mall adds Martin Luther King tribute: There will an anticipated crowd of more than 250,000 spectators Sunday for the dedication of the King memorial – a tranquil monument of stone, greenery and trees along the northwest edge of Washington’s Tidal Basin that will honor the slain civil rights leader. Sunday’s ceremony, which coincides with the 48th anniversary of King’s “I Have a Dream” speech, will officially open the first monument on the National Mall honoring an African-American. The $120 million memorial is part of a burgeoning number of monuments in the nation’s capital recognizing African-American contributions to American life and culture. Memorial Review A Mirror of Greatness, Blurred: It is a momentous occasion. Into an honored array of presidents and soldiers — the founders and protectors of the nation — has come a minister, a man without epaulets or civilian authority, who was not a creator of laws, but someone who, for a time, was a deliberate violator of them; not a wager of war but someone who, throughout his short life, was pretty much a pacifist; not an associate of the nation’s ruling elite but someone who, in many cases, would have been prevented from joining it. Remembering Martin Luther King and the March for Jobs and Freedom: With the formal unveiling of the statue of Dr. Martin Luther King on August 28 – the anniversary of the historic March on Washington for Jobs and Freedom – the National Mall will house a memorial to a man who never held the nation’s highest office but brought it closer to its highest ideals. Earthquake alters MLK plans: The official Wednesday night opening event of the five-day dedication celebration of the new Martin Luther King Jr. Memorial has been moved from the National Building Museum to the Washington Convention Center, officials announced. Eugene Robinson: A dream still out of reach: As the nation honors the Rev. Martin Luther King Jr. with a stirring new memorial on the National Mall, let’s not obscure one of his most important messages in a fog of sentiment. Justice, he told us, is not just a legal or moral question but a matter of economics as well.